This is AAA Grade Swiss BlueTopaz originated from the mines in Brasil. 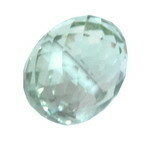 The stone is in size: 6 mm ( 3 ct.) Round shape and the color is Swiss Blue. It is a Faceted drilled stone. For more detail about this gemstone bead please check the table below.